Mastered At – LeBass Productions, Inc. Published By – May 12th Music, Inc. Published By – Edition "Get Into Magic"
Track 1-1 published by Gradington Publ. / MCA Music Publ., Inc. / Zomba Enterprises, Inc. (ASCAP). Originally performed by Deborah Cox. Track 1-2 published by Reswick Songs (ASCAP). Originally performed by Tina Arena. Track 1-3 published by Groove 78 Music, admin. by Almo Music Corp. (ASCAP) / ECAF Music / Sony Songs, Inc. (BMI). Originally performed by Toni Braxton. Track 1-4 published by TBM Music / 2 P's (GEMA). Originally performed by Twenty 4 Seven. Track 1-5 published by EMI Virgin Music, Inc. (ASCAP). Originally performed by Pet Shop Boys. Track 1-6 published by Warner Brothers Music Corp. (ASCAP). Originally performed by Donna Lewis. Track 1-7 published by May 12th Music, Inc. / Warner-Tamerlane Publ. (BMI). Originally performed by Madonna. Track 1-9 published by Jobete Music Co., Inc. / EMI April Music, Inc. (ASCAP). Originally performed by Janet Jackson. Track 2-1 published by Quandra Sound Music / Uni-Chappell Music, Inc. (BMI). Originally performed by Quad City DJ'S. Track 2-2 published by Abfahrt Publ. / Warner Chappell / Edition Get Into Magic / Warner-Tamerlane Publ. Co. (BMI). Originally performed by Culture Beat. Track 2-3 published by Pending. Originally performed by Bizarre Inc.
Track 2-4 published by Peer Music Ltd. (BMI). Originally performed by Gina G.
Track 2-5 published by Sony Tunes (ASCAP) / Careers BMG Music Publ., Inc. (BMI). Originally performed by Crush. Track 2-6 published by Be's Songs (SABAM). Originally performed by 2 Fabiola. Track 2-7 published by GEMA. Originally performed by Motiv 8 & Kym Mazelle. Track 2-8 published by Sony-ATV Songs / Rye Songs / EMI April Music, Inc. / Full Keel Music (ASCAP). Originally performed by Mariah Carey. Track 2-9 published by Warner Chappell Music (ASCAP). Originally performed by Robert Miles. All songs ℗ Power Music. 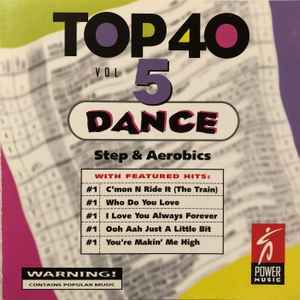 Digitally mixed and edited for LeBass Productions, Inc. Digitally mastered at LeBass Productions, Inc.
A megamix of popular songs used by aerobics instructors. No artists are listed and all tracks are dance cover versions. The original artists have been listed after the publishing information of each track, but do not actually appear anywhere on the release.